July, you’ll remember, was very hot. After a winter that went on and on, there was a very short spring and suddenly we were in summer. The thermal store got up to 95°C and the solar thermal panels were about to switch themselves off, because 95°C is the maximum temperature that the system was set to. The panels would have emptied themselves into their expansion tank. The thermal mass did its job of preventing the house heating up too quickly during the day and yet keeping it warm at night. In the really warm weather the house did eventually get too warm, so we opened the skylights and let the hot air out. By the end of October, we’d been in the house a full year and can therefore provide full year figures for electricity generation and consumption. The house is on Economy 7, so there are two meter readings for electricity imported. Over the period 19th October 2012 to 1st November 2013 we bought in 1112 kWh at night and 2748 kWh during the day – a total of 3860 kWh. Over the same period the PV system generated 4009 kWh. The EFD Blue+Price Promise 2013 tariff we were on charged 18p/day standing charge, 11.32p/kWh day rate and 5.92p/kWh night rate. So we paid ((365+13) x 18 + 1112 x 5.92 + 2748 x 11.32) x 1.05/100 = £467.19 (inc VAT) for just over a year. So the electricity bill was (roughly) minus £333. Financially this was very encouraging, although it has to be admitted that the EDF tariff we were on was quite competitive. We’re now on Blue+Price Promise 2014, which on a similar usage means that the price of the electricity bought in is about 25% more (and people moan about 9% increases!). The rates have become 6.81p (15% increase) and 14.73p/kWh (30% increase) for night and day rates respectively. What was that switching site? During last winter (i.e. 2012-13) we failed to record when the log burner was lit and how much wood we used. This autumn and winter, however, we have been doing so – having spent quite a lot of time sawing and splitting 55 barrow-loads (builder’s barrow) of dry wood during the early part of the year. (Keeps me fit!) Much of this had been collected over some years, saved on the basis that anything thicker than my thumb was firewood – and anything thinner got shredded and put into a compost heap. The information on this is discussed in a separate article. Getting up to date at last: thanks for your patience! 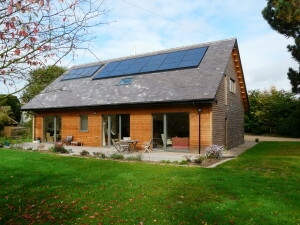 This entry was posted in Electrics, Solar PV, Solar thermal, Thermal mass, Thermal Store, Uncategorized, Ventilation. Bookmark the permalink. Hi, I’ve just come across your blog. I’m waiting to see if my offer on a piece of land has been accepted. I’d like to build a very similar home. Can I be really cheeky and ask for an idea of your total build cost please. I haven’t had chance to read back to all your blogs to find how many bedrooms and if you put any details of the house design so I can see if it is comparable. Thanks for such a great blog it’s really inspired me, I’m just a bit worried I won’t have the funds to reach passivhaus standards. Yes, we spent £308K on 297 m2. It’s 3/4 bedrooms 1 downstairs and a large utility room and this figure includes some things we don’t use as well as all the equipment. Offsetting this, we did all the decoration ourselves, so only the cost of the paint, brushes etc. (There’s a LOT of painting in a new house!) And I had the first fix electrics and the testing done professionally but did all the second fix electrics myself.